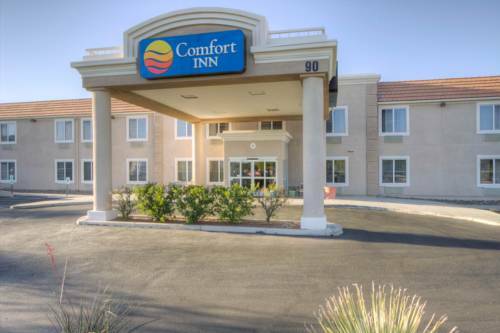 The Comfort Inn hotel near the Titan Missile Museum in Green Valley, AZ will get you rested and ready for anything. This pet-friendly hotel is near destinations like Madera Canyon, San Xavier Mission, Tubac Presidio State Historic Park and Patagonia Lake State Park. Enjoy amenities like free hot breakfast, free WiFi, outdoor pool, a meeting room, laundry facility and access to copy and fax machines. Guest rooms include a refrigerator, microwave, coffee maker, hair dryer, iron and ironing board. Also, earn rewards including free nights and gift cards with our Choice Privileges Rewards program. Truck Parking available in Truck lot next to paved parking. Pet accommodation: 25.00 USD per night, per pet. Pet limit: maximum of 2 pets under 50lbs. Limited Pet rooms available, please call hotel direct to insure that one is available for you and your pet. Pet must be checked in at Front Desk and when room is being reserved. All Pet rooms located on Second Floor, elevator is available. Truck Parking available in Truck lot next to paved parking. The authentic Boot Hill Cemetery is an appropriate place to begin or end a visit to Tombstone. ~55 miles from Green Valley. Perfectly preserved whoring and party hub of 19th century Tombstone. 140 visible bullet holes in its walls. Home to ghosts and a diminutive Merman. ~56 miles from Green Valley. Hollywood cowboy Tom Mix sure could handle a horse. Unfortunately, he couldn't handle a car quite as well. ~67 miles from Green Valley.